Arrival in Buenos Aires. In the evening you will be taken to a tango house for dinner and to visit one of the most authentic tango shows in the city (shared basis). Half day city tour to get a first glance of Buenos Aires and enjoy a cup of coffee & snacks at famous Café Tortoni, the oldest literati café of the city. On optional basis you can book an Argentina culinary experience to learn the best of Argentine cuisine and culture together with other international guests. Flight to Ushuaia. Ushuaia is the capital of the territory and the southernmost city in the world. Visit the breath-taking Tierra del Fuego National Park. In the afternoon continue to an estancia to visit the farm operations. Then you will take a short sailing trip to Isla Martillo to watch a colony of Magellan and Gentoo penguins and walk close to them (best penguin season: mid-November till mid-April). Return to Ushuaia (on shared basis). Flight to El Calafate. Optional: Visit of the Glaciarium Museum. Another highlight is the full day visit (on shared basis) of the magnificent Glacier Perito Moreno at Los Glaciares National Park, with its immense millenary block of ice. Drive by public bus to Puerto Natales in Chile. Full day visit to the Torres del Paine National Park (on shared basis). The lagoons, lakes and isolated peaks make this park an unforgettable sight. The park is home to condor, puma, guanaco and Patagonian deer. In 1978 the park was declared a Biosphere Reserve by UNESCO. 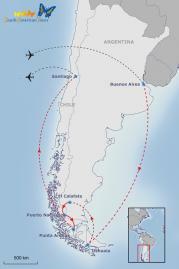 Drive by public bus to Punta Arenas and flight to Santiago. Half day city tour including visit of San Cristóbal hill with a memorable panoramic view of the city. On optional basis you may book a wine adventure within Santiago to discover the secrets of Chilean wine. Transfer to the airport and departure flight or post-tour.